As promised in the June issue, the July, 1934 issue was slim – 16 pages, plus the Cosmos insert – and contained no fiction. Julius Schwartz inherited the editorship of a publication with limited publishing bandwidth. The content returned to the original focus on news and reviews. There are no references to Cosmos in this issue, beyond the new chapter itself. One almost senses that the editors were tiring of the effort and resource requirements demanded by the serial. The space it was consuming detracted from their broader ambitions. While en route to Louisiana, to gather material for a Cajun story of werewolves and vampires in the swamps around Lake Pontchartrain, Ralph Milne Farley’s almost completed manuscript of his chemistry novel “The Immortals” was stolen! Altho he had carbons of most of the novel, he was faced with the possibility of having to rewrite part of it from memory. However, the criminal, evidently realizing what a dastardly thing he had done, became panic stricken and abandoned the ms. on another train. I.C. railroad officials recovered the manuscript and returned it to Mr. Farley. “The Editor Broadcasts” was populated mainly by praise for the May issue, especially the new “Cigarette Characterizations” feature and the satire “The Skylaugh of Space”. 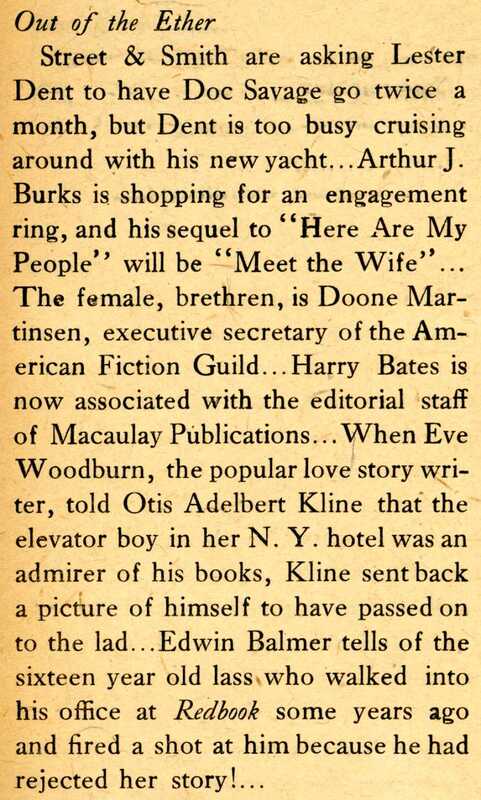 Separately from Schwartz’s “The Science Fiction Eye,” Mortimer Weisinger also penned a monthly news / gossip column, “The Ether Vibrates.” The snippets ranged from semi-scandalous to heartwarming, and would be worthy of the finest Hollywood rags of then and now. Read Chapter 13 of Cosmos.